We recently wrote about how EVERSPACE [Steam] was looking a bit iffy on it coming to Linux, but it seems it was a case of miscommunication. It seems the developer got their wording a bit muddled, as it's likely they aren't a native English speaker. Before they said some issues "could" be fixed, but it appears they actually meant that some of the issues have been fixed already. Quote Maybe my English was a bit confusing. With "many of these issues could be solved" what I was trying to say was "we were able to solve many of these issues". The mouse cursor thing for example, but thanks for the "unclutter" tip. I'm really happy they realised they muddled it up a bit and replied again, as I was left rather sad by the initial reply. 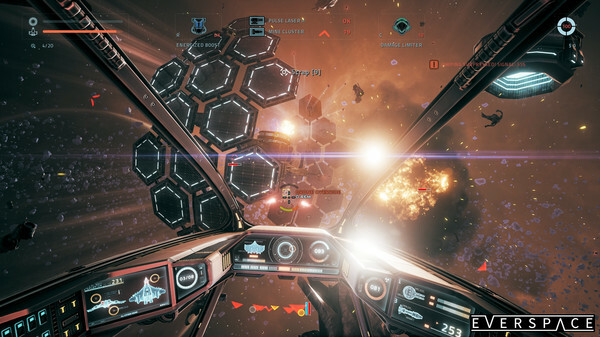 EVERSPACE™ is an action-focused single-player space shooter combining roguelike elements with top-notch visuals and a captivating non-linear story. It takes you on a challenging journey through an ever-changing, yet beautifully crafted universe full of surprises. Your skills, experience and talent for improvisation will be tested continuously while learning about your own existence through encounters with interesting characters, each having their own part of the puzzle to tell. Each run will be exciting as you will have to face completely new situations keeping each part of the game long-lasting and generating lots of individual, meaningful moments to experience. However, no matter how skilled a pilot you are, death is inevitable, but only the beginning of a much larger journey. I'm not a native speaker either, but to my understaning, their wording was not wrong (just missinterpretable)? Great single player space shooter, if it comes to linux i'll buy it. Yeah easy to mix that one up. I think most (native English speaking) would look at that as a possibility sentenced. Could be == possibly will be. Rather than "we did this because we could". "many of these issues could be solved"
This can mean an event that happened in the past, or something that might happen in the future. One of those grey areas of interpretation I would say. Great to hear that the Linux version is still progressing though. Eike I'm not a native speaker either, but to my understaning, their wording was not wrong (just missinterpretable)? No, the wording was wrong, or at best a usage so rare that nobody would ever expect that meaning from that phrasing. Yes, could is sometimes the past tense of can, but there are problems. One is simply the meaning of "can". It means there is an ability for something to happen, not necessarily that it does. Set in the past, that ability would be gone by the time we reach the present. So for instance, in your quotation, it is likely that we can't hear the clear belling any more. We could in the past, but not now. Similarly if I were to say that I could have fixed that kind of problem in the past (back when I still had the right tools, say) it doesn't imply that I actually fixed any problems and suggests that I can't any more. The more relevant problem is that that's not what that construction normally means. You can say "could" in ways that mean past, but that isn't how you do it. If I say something "could be fixed" it isn't normally a past tense. It's more of a conditional. The difference between saying a problem "can be fixed" and that it "could be fixed" is that, while both say the capacity to fix exists, "can" suggests at least a strong likelihood of the fix taking place, quite likely here and now. "Could be fixed" does not. It implies that while the capability exists, it either won't actually happen or will only happen if some other condition is met. As in, "I could help you, but I won't" or "I could help you, but you'd have to do something for me in return". Oddly, the negation can be a past tense. If I say "The engine damage couldn't be fixed" that generally means we tried and gave it up as impossible. (Shrug) Language is weird. Purple Library Guy . (Shrug) Language is weird. The English language is especially weird as alot of words can have several interpretations depending on context(some as in this case conflicting), often this is at odds with other languages that do not have so many words open to interpretation and this means what you think is a clear translation means something radically different in actuality. However on topic its good to hear this is resolved I need a space fix since elite isnt available to me anymore. I find it a little amusing that Liam often writes about some game, that were promised for Linux but now are not as likely to ever reach Linux. Then some days later, the people behind or someone clarifies things and then the game seems more likely to release on Linux again after all. Kudos to Liam. You represent us Linux gamers and the game developers seem to care what you write here on GOL. Keep up the work! English is particularly weird because it comes from two main languages and a couple of secondary ones, with different grammars, all mooshed together (Old English, French, a bit of Old Norse, some Latin, miscellaneous stuff). We ended up with tons of extra words and smashed grammar. Um, right, on topic--yeah, I think I was looking forward to this one although I might be getting it mixed with Shallow Space. Purple Library Guy English is particularly weird because it comes from two main languages and a couple of secondary ones, with different grammars, all mooshed together (Old English, French, a bit of Old Norse, some Latin, miscellaneous stuff). We ended up with tons of extra words and smashed grammar. We should start adding random German words too!